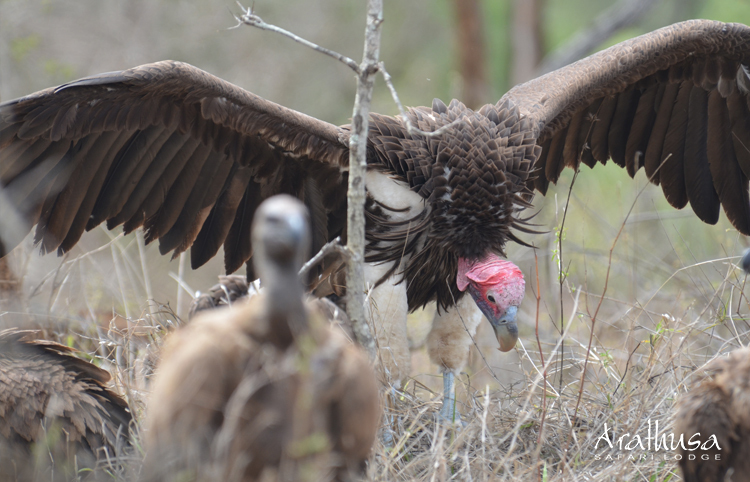 Five species are well represented in the Sabi Sands lowveld due to large predator and prey populations, and include the lappet-faced, white-backed, white-headed, hooded, and Cape vultures. Vagrant palm-nut and Egyptian vultures are also recorded in the neighbouring Kruger National Park from time to time. Rüppell’s vultures and bearded vultures are absent from the area, but found elsewhere in the country. Vultures are infamous for their remarkable ability to detect carrion, which is facilitated by their sharp eyesight – around eight times stronger than human’s. They are able to see a 10cm object (smaller than a baby scrub hare) from a kilometre up in the sky! 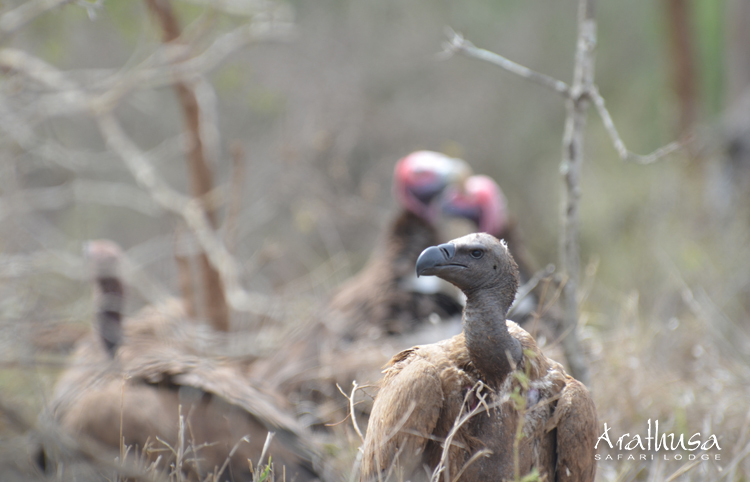 Vultures have a large eye-to-skull ratio and two specialised lenses in each eye – a wide-angle-like main lens for scanning the broader landscape, and a small section of fish-eye-like lens for magnifying part of their visual field. Due to their altitudinal habits, vultures have erectable neck feathers called a ‘ruff’, which functions like a scarf in flight, but folds back when grounded to allow heat to dissipate. This insulation is also necessary because vultures lack head feathers – an adaptation for scavenging inside carcasses. Vultures cannot groom this area and soiled feathers would make them more prone to infection. Vultures’ claws are less talon-like than other raptors as they are less reliant on catching live prey. Attending carcasses is by far their preferred feeding method, although these birds do catch fish from drying pans from time to time. However, their blunted claws come in handy when taxiing for take-off, aiding airflow over the leading wing edges to provide the necessary thrust. Vultures are heavy birds and have wings largely designed for gliding. Flapping-powered flight would not be energy inefficient. On overcast days, which lack thermals, vultures are mostly grounded. But when the sun peaks out and with only the slightest thermals on offer, these birds can easily get airborne by banking their wings and spiraling tightly, similar to ascending a staircase. They also respond to any other vulture showing signs of having discovered successful thermal spots. Apart from the ‘vulture telegram’, these birds also detect the presence of carrion by homing in on and following lions, hyenas, cheetahs, leopards, wild dogs, jackals, tawny and bateleur eagles to kills. When vultures detect a promising meal, it is a race to be first in the feeding frenzy and they queue up waiting for the predators to have their fill before they peck in. This results in scenes of vultures literally falling out of the sky at speeds of over a 100km an hour! When the vultures get a chance at the dinner table, they do not waste the opportunity, often having fought hard with conspecifics for their literal place in the pecking order. Each bird rapidly fills its crop, which can accommodate an extra 1.5kg of meat, making it like an extra stomach! In so doing, vultures fulfill the important ecological role of cleaning up decaying animal matter from the environment and removing the potential for disease to breed and spread.